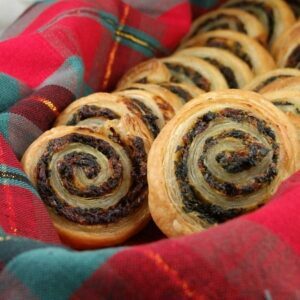 This recipe has been featured in a how-to post on The Recipe Girl blog: Spinach & Sundried Tomato Puff Pastry Pinwheels. These are incredibly easy and delicious. They'd be great to keep in the freezer to use at a moment's notice. Impressive and festive looking treats for the winter holidays too! 1. Prepare filling: Drain spinach well, squeezing out moisture and pressing between layers of paper towels. Stir together spinach, sundried tomatoes, mayo, Parmesan and spices. Cover and refrigerate until ready to use. 2. 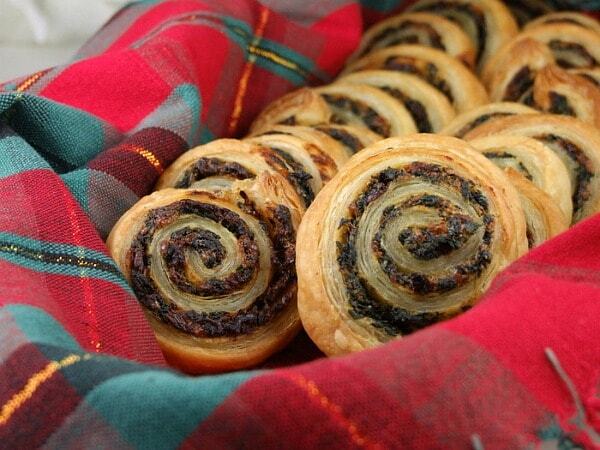 Thaw puff pastry at room temperature for 30 minutes, or until defrosted and easy to unfold. Unfold pastry and place on a lightly floured surface. Spread one-half of the spinach mixture evenly over pastry sheet, leaving a 1/2-inch border. Roll up pastry, jellyroll fashion, pressing to seal seam; wrap in plastic wrap. Repeat procedure with remaining pastry and spinach mixture. Freeze 30 minutes; cut into 1/2-inch-thick slices. 4. Bake for 20 to 25 minutes, or until golden brown. *Prepared rolls may be wrapped and frozen for up to three months. Cut and bake slices as needed.